Gemini Rue, latest point-and-click adventure from developer ‘Wadjet Eye Games’, is a rather well made adventure game for the PC. The story is interesting, the characters follow the Noir theme well and the setting is perfect for this type of story. Like any good adventure game, it is both puzzling and rewarding and does a good job at gaining your interest. You’re likely to think about solutions to puzzles while you’re away from the keyboard simply because some puzzles can be quite a puzzler. You play as Azriel Odin, an ex-Boryokudan (intergalactic mafia), looking for a certain person on a planet called ‘Barracus’. Barracus is a world covered in constant rainfall and is governed by the deadly Boryokudan gang who were able to overthrow the previous Government many years earlier. In order for Azriel to locate the person he is after, he must enlist the aid of a fellow ex-Boryokudan by the name of Matthius. With Matthius’ help he learns the location of the person that he is searching for and begins a quest to find them. The story branches itself early on as players are introduced to a second main-protagonist – ‘Delta-Six’. Delta-Six awakens at an unknown location with his memories removed and is lead around a secret facility, called ‘Center 7’, that is lead by ‘The Overseer’. He is required to complete a series of tests that seem more like a personality reconstruction than a rehabilitation scheme. What kind of civilian needs to undergo weapons training? It is quite clear that things are not as they seem as players adventure through Delta-Sixes time in the secret facility. 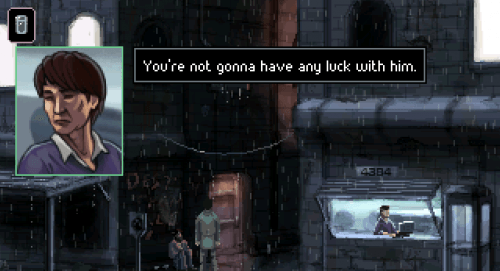 The way Gemini Rue is played is fairly standard of point-and-click adventure games. That is, you point at a location you want to move to, an object you want to be using or a character you want to interact with; then you click on them and then you’ll usually do that thing. In Gemini Rue, your last used action becomes your default action for when you click on something to use but can be manually switched using a right-click menu over the top of any usable object or character. Center 7 – Delta-Six’s home. Quite often you’ll find that you’ve come to a point where you need to use a specific skill or item on a particular object or character and have no idea what it is. Combining the wrong combination can be either disasterous, funny or even sometimes indifferent. I can think of at least one part with a fairly puzzling action (not like explosions, but things you have to do) sequence that was actually took a fair bit of thought power and trial and error. Once you get these puzzles down they’re quite rewarding mentally. Your actions can be selected through a right-click menu and are limited to what ever items you have in your inventory and four actions that your character can undertake. Each action is as follows – Hands, Mouth, Eyes and Foot. It doesn’t take much to work out what each thing does on a particular object, like if you use hands on a box – you’ll be able to push it around. Or if you use foot on a door, you’ll be able to kick it in… sometimes. Other actions are unlocked or used later, like when you have another character in your party, you can double click them to activate them and then click on something else for them to use that object. Another action that is unlocked later is the ability to switch your main player character, this *spoiler alert* switches between Azriel and Delta-Six, and is conducted through clicking the other player characters portrait on the top right corner of the play space. This not only changes your playable character but also to the location of that character. For example if Azriel is on Barracus and Delta-Six is on Center 7 and you switch from Azriel to Delta-Six, then you will change from Barracus, where Azriel is, to Center 7, where Delta-Six is located. Though it should be noted that the character you just switched from will remain wherever it was that you left them. Where the game differs from most point and click adventures is in the combat. In combat players must gun-fight their way to survival. You’re given limited ammunition and usually a few enemies to dispatch. The gunplay differs from not only point-and click games but also shooters in that you do not get point click to shoot enemies. You’re basically stuck behind cover and are given three options – A and D – which are to pop out left or return to cover/pop out right. Once you are out of cover you can hit control to gather accuracy for your shot and/or press spacebar to fire a round at the enemy that you’re facing. One of the good things I found is that if you hit control while out of cover and pop back in, you can still gather accuracy to get a decent shot when you pop back out to shoot the enemy. Against multiple targets a kind of rhythm/puzzle aspect comes into the gunplay where you must time your actions against both opponents to avoid being shot at or wasting all of your ammo. Once you’re out of ammo or bullets, it’s pretty much game over. Sure, you can sit behind cover forever if you’re out of bullets, but that’s all you can do really. But if you run out of health, you’re dead and must reload the game. Like most classic PC games, the Fx keys actually do stuff, like F1 shows you a key map of the Fx keys. Escape brings up a menu for players who can’t be bothered with the Function keys. In the menu/function keys you have the usual options, Exit, Resume, Save, Load, Options, etc. though it should be noted that exit is shortcutted to alt+x; just like those classic games. Gemini Rue not only follows classic adventure games gameplay wise, but also in terms of graphics. 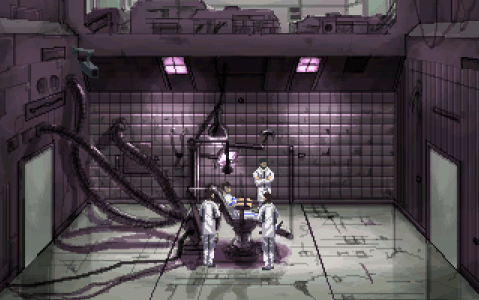 The game is built on sprites and pre-drawn backgrounds which give the game a retro look and feel. The art of the game is quite gloomy and gritty, which is very fitting of the Noir theme represented within the game. In the game there isn’t much in the way of graphical gimmicks as everything looks pretty much how you would expect it to. People look like people, streets look like streets and guns look like guns. Other ingame items, like the communicator or the stick that you acquire early on look just as you expect them to also. The environment on Barracus is a dark and gloomy one, with it’s perpetual rain and constant low light, whereas, Center 7 is a cleaner looking place which makes it feel more like a hospital or a Spacecraft from Star Trek. Speaking of Spacecraft, Azriels ship is something that you would expect Han Solo or Malcolm Reynolds to fly in as opposed to the clean and bright Enterprise that Kirk or Picard would command. It is this direction that gives the ship itself a personality, as any Noir story piece should, and gives it a life of it’s own. The same can be said for Barracus and Center 7, that the art direction is what makes them unique and gives them their own personality. Gemini Rue is a fully voice overed game, with every piece of dialogue having a voiced component to it. One of the things that I liked about the voice acting is that some of the characters do not sound as you expect that they would given their position. Like for example with The Overseer on Center 7. You’d probably expect a sinister voice given the obviously shady stuff that they do at the center, but you are instead treated to this friendly sounding guy which I thought to be quite a good direction. Another nuance that I also enjoyed with The Overseers voice acting is that you can hear him clearly getting more and more annoyed and Delta-Six while still trying to keep a friendly sounding voice. It’s this type of conflict in the voice work that gives you a sense of character towards The Overseer that you probably wouldn’t get a sense of otherwise. Lately I’ve found that most games soundtracks have been (literally) putting me to sleep so I usually just throw my own music on in the background to keep me alert. Not so with Gemini Rue. It has this ambiance that fits each scene perfectly while not sounding like the audio engineer or composer was trying too hard to sound epic. They’ve kept it simple and it works really well with the scene. Sometimes you don’t notice it, but you know it’s there, affecting your gameplay, your thinking and when you do notice you think to yourself ‘Man this is good, I love me some ambiance’. This is not sarcasm either, it just fits so well that you believe that it’s a part of the scene and not some epic score tacked on over the top of the game. 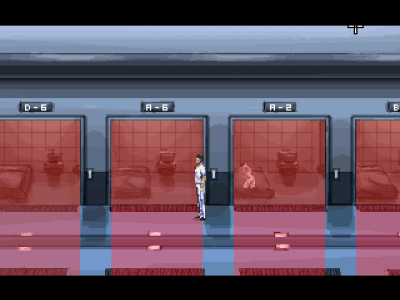 In the game, you get use objects that make noises, like terminals and guns. Each object that you use sounds like you would expect it to and adds a certain level of friction to whatever it is that you are doing. It’s like you’re doing something and you know that you’re doing it because of the sound, not that you’re doing it because you can see it with a cheap noise thrown over the top. 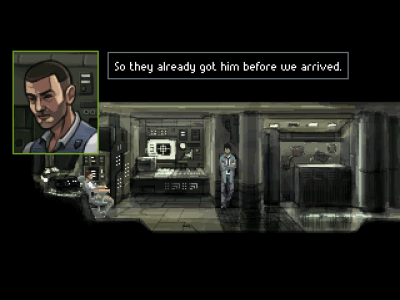 Gemini Rue is an interesting point-and-click adventure with a sci-fi Noir setting. It looks like a classic adventure game, it plays like a classic adventure game and it sounds great. While the game is probably not for everyone, like people with low attention spans, low problem solving skills and/or low patience, it is a very good game – not only for the PC, but in general. If Wadjet Eye games had released this game in the early 90s they would probably be quite a force in the gaming industry today. This game has the potential to bring back the point-and-click genre to the mainstream and I would advise all point-and-click fans to pick it up ASAP, as well as all gaming enthusiasts. Especially those who loved the point-and-click adventures from the earlier days.